Leash training is essential for both dogs and their owners. Not only is it a part of good dog etiquette, but a leash-trained dog will be safer and more comfortable out for walks. Not all dogs adjust easily to leashes, however, and when a dog refuses to walk or pulls on the leash, there are several tricks that can help correct that behavior. Before leash training can begin, it is important to have the right collar and leash. The collar should fit snugly but not tightly around the dog's neck, without chafing or pinching. Harnesses are not recommended when leash training, since a dog's pulling power is in its chest, and it will be harder to correct inappropriate behavior with a harness. 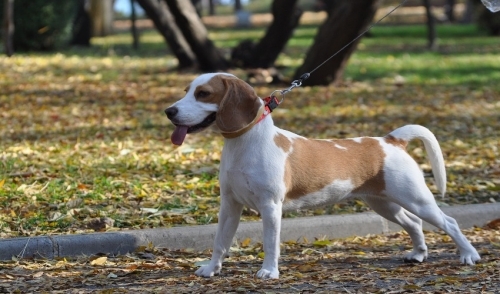 The leash should be long enough to allow some slack, but not so long that the dog has free movement over a large range. Longer leashes can be introduced after training, but until the dog has learned proper leash manners, a length of 4-6 feet is best. Both the collar and leash should be in good condition without any fraying or damage that could break under unexpected pressure. The clip connecting the collar and leash should be firm and secure, and the collar and leash should be wiped clean as often as necessary so no dirt can build up that could cause irritation to the dog. There are many reasons why dogs may pull on a leash or resist walking. If the dog has not been leash trained before, the sight, smell and feel of the leash and collar could be frightening or make the dog nervous, which can lead to resistance or balking. A dog that has been cooped up may be overly excited to go out on the leash, which can lead to more pulling or ignoring commands. Similarly, if dogs are interested in nearby items, they may be more likely to pull, or if there is something in their sight that scares them, they may resist walking. If the dog is not used to the collar or leash, allow them to see and smell the gear first. Rub the leash through your fingers to transfer some of your scent along its length to help your dog adjust, and allow them to wear the collar without the leash long before going for a walk. The upper part of a dog's neck is the most sensitive area. The collar should fit in this area, which will allow for more gentle corrections because the dog will feel the effects more quickly. If the collar is too loose or low, corrections will not be as effective. A shorter leash allows firmer control without the dog getting so far away that they are tempted by more distractions. The touch of the leash and collar is an important part of dog-owner communication, and a shorter leash keeps the owner in better control of their pet. If a normally well-behaved walker starts to have problems, check the dog's legs and feet for thorns, bruises, cuts or any swelling or tenderness that can indicate an injury. Visit a veterinarian to help with serious issues, or allow the dog to heal before resuming leash training. Dogs have excellent hearing, and verbal commands can be an important part of leash training. Use an excited voice to say "Let's go!" to encourage forward movement, and use harsher, firm tones with "No!" to discourage improper behavior. If a dog pulls, stand still and do not allow them to advance toward whatever has caught their interest. When the dog stops to look around at you, reward that pause with a friendly word or small treat. If they resume pulling, stay still until they stop again, then move in the proper direction to lead them correctly. If a dog is easily distracted on a walk, a quicker pace can reduce unwanted behavior by giving them less time to notice new things that could lead to pulling. Dogs will also enjoy the excitement in their owners' pace, and a brisk walk is better exercise than a slow stroll. Any training is more effective if it is repeated and refreshed. More frequent walks will not only remind a dog about proper leash manners, but will be more exercise and more bonding between dog and owner. 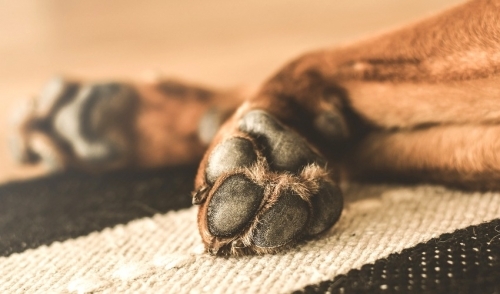 Small treats can reward good walking behavior, though it is important to use them as a tool only, and reinforce the dog's successes verbally or with a happy pat as well. Eventually, the dog should have mastered easy, comfortable walking without a treat. For the best training, combine several techniques to continually reinforce your dog's behavior. Always be patient with your pet, and in time you both will enjoy hassle-free walks.